Found 4 file extension associations related to eBooks Writer and 1 file format developed specifically for use with eBooks Writer. 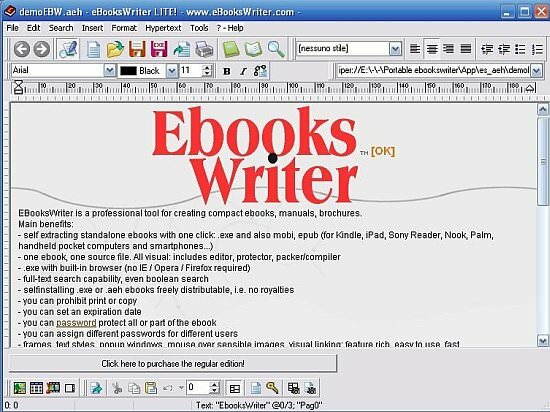 eBooks Writer is a commercial software for creating e-books and other electronic documents. A quick, powerful all-in-one environment: create, edit, pack, protect stunning e-books, e-catalogues, e-manuals, e-depliant, e-brochures... and much more! Users can build compact self installing .exe ebooks with one click; no separate software required. Or alternatively save the ebook as IDPF Opf, .mobi and .epub (for Kindle, Macintosh, Sony Reader, Nook, Palm, iPad, Pocket PC, Windows Mobile / CE, SymbianOS, iLiad, eBookMan, HP webOs. If you need more information please contact the developers of eBooks Writer (Visual Vision), or check out their product website.